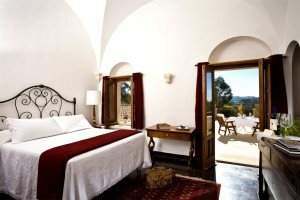 A truly luxurious and unique historic converted monastery, steeped in history. A stay at the Eremo della Giubiliana will make you part of this building’s rich history, one which starts as far back as the 12th century amid the Hyblean plateaus of southern Sicily. Beginning life as an ecclesiastical feudal hold of Renna, over the last 900 years the convent building has served as an Arab home, a defensive fortress and as host to the Knights of the Order of San Giovanni. Today the building functions as a 5-star, luxurious hotel, though the heritage remains in the retention of authentic features. Ancient pitch stone features prominently throughout the building and its 17 bedrooms and suites, once serving as cells in the monastery. 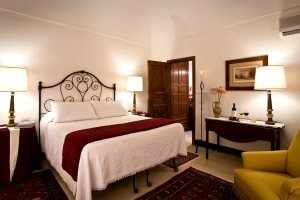 Each bedroom is unique, and although they feature modern comforts such as televisions and air-conditioning, they also have the old-style Sicilian furniture, iron beds and original household goods that define these gloriously authentic bedrooms. Local produce is an important concept at the Eremo, something experienced in the superb on-site restaurant, Don Eusebio, while a cooking course under the watchful eye of its head chef will teach you more about these local flavours. A prime location allows for exploration around the area, with the fascinating old city of Ragusa and the beaches of Marina de Ragusa within a short drive of the hotel. Pool, Restaurant Don Eusebio, The Crypt wine cellar, bar, complimentary bicycles, parking, room service, Wi-Fi. Payable locally: Asphodelus wellness area, Culinary School with cooking classes and wine tasting, laundry, baby-sitting. 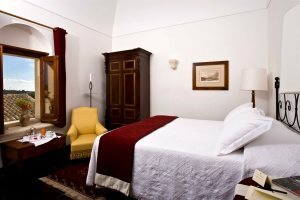 The bedrooms are all different from each other, with original pitch stone floorings, wrought iron beds and old furniture and en-suite bathrooms have a bath with a shower. These rooms are situated either on the first floor or the main floor looking over the aromatic “Hortus” Mediterranean gardens with aromatic plants, centuries-old olive trees, and an old “Arab” fountain. Room Corte Araba is on the first floor, with original furniture, Persian carpets, a large bathroom with whirlpool, high vaults and pitched pavement. There is a terrace overlooking the private garden and the countryside and eventually the sea connecting Sicily to Malta. 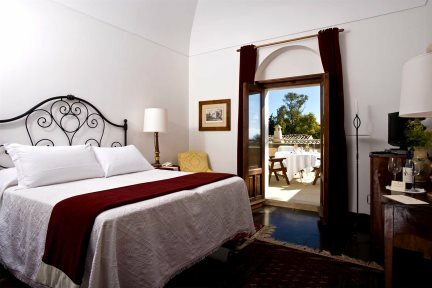 Room Alcova is on the first floor, with a high wrought iron bed (original in Sicily) under the typical barrel vaults. The floor is made with pitch-stone. It has a large bathroom with original furnishings and oriental carpets, whirlpool and a terrace overlooking the archaeological park and the Antiquarium. Overlooking the stone courtyard dominated by a large palm tree with two levels: the main floor a lounge area dominated by a 18th century sacristy vestry. The upper floor, to which the main floor is connected through a staircase with the original 18th-century chestnut wood balustrade, there is the bedroom and a large bathroom with bath. The ground floor, on request, can be connected to another double bedroom if required for families. Suite Frate Nero owes its name to the black cross engraved on the white stoned wall within it and to the black tunic the Malta monk knights used to wear. Situated on the ground floor with thick stone walls and white stoned paved floor. The furniture is antique with original Modica chests of the XVII century, old Persian carpets, damask armchairs, and a whirlpool. 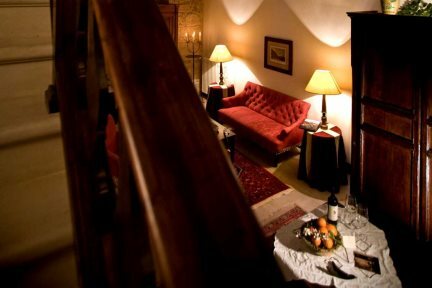 Suite Torre del Canonico is so called because it was used by the owner’s uncle, the “Canonico” Ignazio Nifosì, Camerlingo at the San Giorgio cathedral in Ragusa Ibla and renowned scholar of local history and archaeology. The tower of the XV century has three floors. On the ground-floor there is a lounge area. On the first floor is the bedroom with vaults and capitals of the XV century overlooking the garden and the “Corte Araba”. From the tower’s terrace you can see the highlands, the coast and Malta. One of the eight towns in the Val di Noto world heritage site, Ragusa is set amidst two deep valleys, Cava San Leonardo and Cava Santa Domenica. 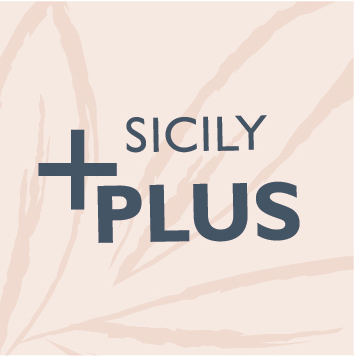 Split into two parts, the modern town is perched higher on the hillside whilst the picturesque old town Ragusa Ibla is lower down the hillside, filled with baroque architecture and narrow cobbles streets. Also in the old town visit the Church of San Giovani. Ragusa is also particularly famed for its gastronomy and produces some excellent cheeses. A very popular large beach with golden sand and clear waters. There are numerous facilities along the beach including sunloungers and parasols for hire. In the heart of Vendicari Nature Reserve lies an 8km stretch of golden sand dunes, lagoons, cliffs and hidden bays. There are no sunloungers, bars or water sports and no crowds. A truly wonderful place to swim and well-suited to families but be sure to take anything you might need including water with you. A favourite beach in this area as it is stunning with beautiful clear, turquiose water and a gently shelving sandy beach which is great for families. Head for the section that is not owned by a particular hotel or resort, where there is a beach hut serving ice cream and drinks. This beach does get busy in peak season. Drive around the late baroque towns of the Val di Noto. The valley holds a series of picturesque towns composed almost entirely of baroque churches, palaces and house - a must see for architectural and historical enthusiasts. The most remarkable Roman ruins in Sicily and listed as a UNESCO World Heritage Site, this grandiose 4th century Roman villa is home to one of the finest floor mosaics in existence.